Any of several sweet desserts consisting of bananas and soft toffee (made with caramelized condensed milk); originally and chiefly a flan of shortcrust pastry filled with toffee and sliced bananas and topped with whipped cream, frequently served sprinkled with coffee powder and with coffee whipped into the cream. Credit for the pie's invention is claimed by Nigel Mackenzie and Ian Dowding, the owner and chef, respectively, of 'The Hungry Monk' Restaurant in Jevington, East Sussex. They claim to have developed the dessert in 1971 by amending an unreliable American recipe for "Blum’s Coffee Toffee Pie". For the toffee sauce, start by placing the unopened tins in a deep pot, cover with water, and bring to a boil on the stovetop. Cover with a lid and transfer to a preheated 285°F oven for 3 ½ hours. Lift the tins from the water and allow to cool completely before opening. Note: The longer they cook, the darker and thicker the toffee will be. 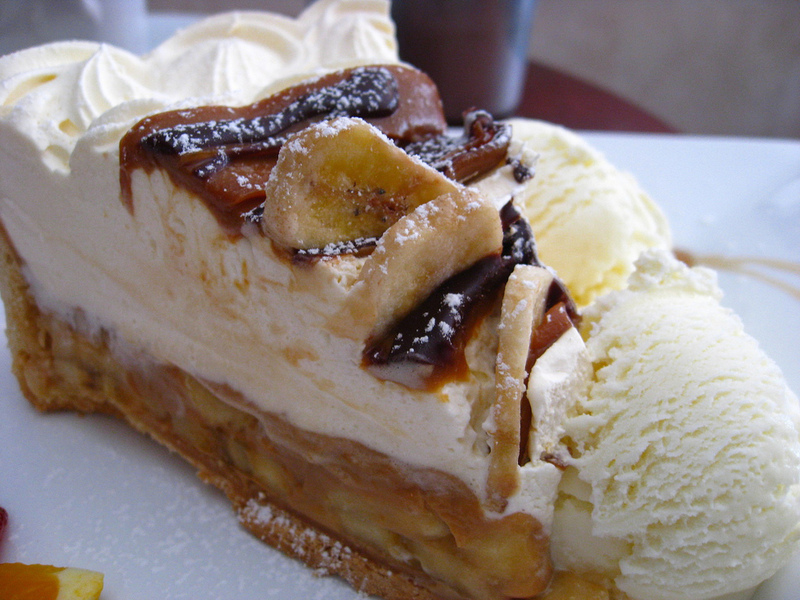 To compose the pie, carefully spread the toffee over the cooked pastry, then top with peeled and sliced bananas. Whip the cream, sugar and instant coffee granules, until thick and smooth. To finish, spoon the cream over the bananas, up to the edge of the pastry, then lightly sprinkle with freshly ground coffee, and garnish with some sliced bananas on top, just before serving. COOK'S NOTE: The caramel-toffee sauce is a great addition to many dishes such as ice-cream and poached pears. This homemade banoffee pie is one of our favourite desserts here at Carnation. An impressive party piece and an ever-popular dessert, but it’s also easy to make. 1. Put the biscuit crumbs in your bowl, then tip in the melted butter and mix it all together. Spoon this into the base and press against the bottom and sides - this is the base of the banoffee pie recipe. Chill it for ten minutes. 3. Carefully lift the pie from the tin and place on a serving plate. Slice the bananas; fold half of them into the softly whipped cream and spoon over the base. Decorate with the remaining bananas and finish with dusting cocoa powder on top. To make the dough: Preheat the oven to 375 degrees and set out a 9-inch pie plate. Combine the flour, butter, brown sugar and chocolate in a bowl and mix until well blended, using your fingertips, a pastry blender or a food processor. Add the vanilla, milk and walnuts and mix well. The mixture should form a cohesive but not sticky mass. If it is too dry, add a few drops more milk. This is a cookie-like dough, not harmed by handling. The easiest way to get it into the pan is to take walnut-size pieces and press them onto the bottom and sides of the pan, making sure you distribute them evenly, with no gaps or thin spots. Press the dough well up the sides, too, then crimp the edges. (If the crust becomes too soft while working with it, chill in the refrigerator for about 20 minutes.) Prick all over with a fork and press a piece of heavy-duty foil snugly into the pie shell. Bake for 8 minutes, then remove the foil and bake for about 10 minutes more, or until the shell is dry and crisp. Remove to a rack and let cool completely before filling. To make the filling: Put the butter in the large bowl of an electric mixer and beat until fluffy. Beating on high speed, gradually add the sugar. Beat in the instant coffee and melted chocolate. Add 1 egg and beat on the highest speed for 5 minutes. Add the second egg and beat for 5 minutes more. Spread the filling evenly in the cooled pie shell, then cover and refrigerate for at least 6 hours, or overnight, before topping. To prepare the topping: Combine the cream, powdered sugar, dry milk and instant coffee in a large bowl and beat with an electric mixer until stiff. Spread in peaks and swirls (or for a fancier presentation, fill a piping bag fitted with a star tip to pipe the topping) over the chilled pie and sprinkle with the grated chocolate. Refrigerate at least 2 hours before serving.